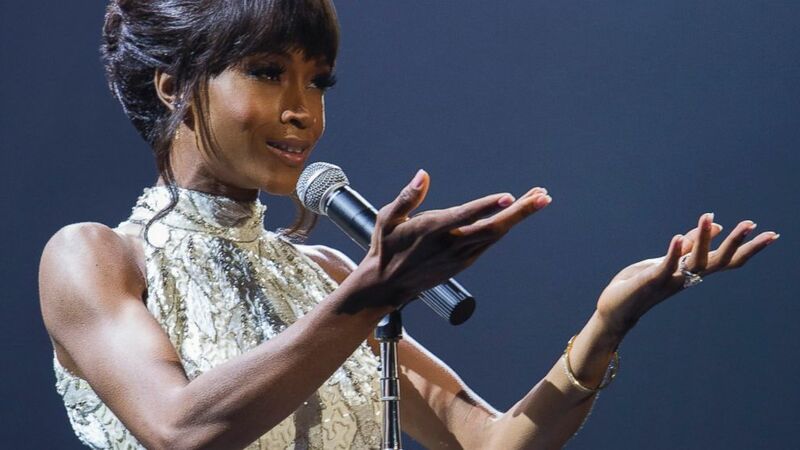 Get the details of Lifetime's Whitney Houston biopic. camera (Jack Zeman/Lifetime/AP Photo) Yaya DaCosta stars as Whitney Houston in the Lifetime Original Movie, "Whitney," on Lifetime. Last year, Angela Bassett announced that she would direct a biopic about Whitney Houston. Tonight, "Whitney," which centers on Houston's relationship with her ex-husband Bobby Brown, premieres on Lifetime. "Her life, her stardom, was so massive. Nothing that’s never been seen or done before, her talent was so anointed and so galvanizing, like nothing ever heard before. She was like no one ever known before," Bassett told Entertainment Weekly last year. "She deserves to have this movie, and another movie, and everything and anything else." 1. The Start Of Their Relationship: In real life, Houston met Brown at the Soul Train Music Awards in 1989, where Brown performed "My Prerogative." (In the TV movie, he sings "Every Little Step," but the outfit is pretty spot-on.) However, if the rest of the scene is to be believed, their first interaction was an icy one, and their relationship was tough at first, with Houston doing drugs recreationally while Brown abstained (Brown has said in the past that she did drugs "way before" they got together). The film also showed Houston struggling to accept the mothers of her beau's children. At one point, while they weren't together, Brown impregnated one of his babies' mothers. The scene in which he tells Houston is explosive. 2. Cissy Houston's Disapproval Of Their Romance: "I'm getting married!" Houston gushes to her family in the film. "I just hope it's not Bobby Brown," shot back her mother, Cissy. "I spent my life trying to keep you and your brothers out of the projects. Now you're marrying into them?" Throughout the rest of the film, Brown and the Houston matriarch don't seem to have much of a relationship. In reality, Cissy wasn't a big fan of Brown's, with whom she told the Associated Press in 2013 that she doesn't keep in contact. "[Whitney] was with someone who, like her, wanted to party," she once wrote of her daughter's relationship with Brown. "To me, he never seemed to be a help to her in the way she needed." 3. Whitney's Miscarriage: In 1993, Houston told Barbara Walters that she had a miscarriage during the filming of "The Bodyguard," which is documented in the film. (Yes, she's wearing her Rachel Marron's glamorous headscarf in that scene.) The aftermath, which features Houston sobbing to Cissy, who reiterates that she shouldn't be with Brown, is heart-wrenching, mimicking the real-life horror the singer felt. "It was very painful, emotionally and physically," she told Walters of the experience. "I was back on the set the next day. And it's over. But I had Bobbi Kristina one year later, and I am blessed." 4. Bobby's Infidelity: In the film, Brown puts his career on the back-burner to support Houston after her miscarriage and the birth of their daughter. Eventually, especially after a woman calls him "Mr. Houston," Brown, self-conscious and with a bruised ego, begins partying too hard and sleeping with other women. Houston catches him and erupts. "Both of us cheated on each other," he confirmed to Lifetime recently. "So that's hard to swallow for both of us. I just think when two people that love each other as much as we loved each other, when they start drifting apart different people come into the situation, into the scenario, and we make mistakes." In the film, she gives him another chance. 5. Bobby's Friend Is Killed In Front of Him: In the film, during a rocky period for Brown and Houston, the New Edition singer's friend was shot and killed in front of him as they left a club. (He calls Houston, who answers the phone mid-performance and then returns to the stage.) Shortly thereafter, Brown is seen dishing about his wife's substance abuse in group counseling only to have his admissions appear in the National Enquirer shortly thereafter. In real life, their relationship was tabloid fodder at that time, and Brown, who was treated for alcohol abuse at the Betty Ford Center, really did bear witness to a pal's murder.